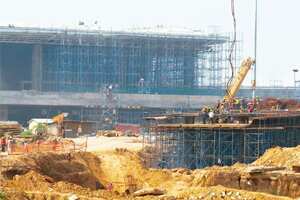 Mumbai: Indian conglomerate GMR Infrastructure Ltd, which has interests spanning from aviation to power, has Rs3,000 crore to invest in existing businesses by March 2011, a top official said. Separate to that investment, the group is also talking to half a dozen investors, including private equity players, about possible stake sales as it looks to scale up its power and infrastructure businesses. “We are in discussion with a number of players... Private equity or any other pure financial investors would come in at holding company level, not at project level," A. Subbarao, group chief financial officer of GMR Group told the Reuters India Investment Summit on Tuesday. Bangalore-based GMR, which builds and manages airports, roads and power plants, has benefited from a government focus on infrastructure. Its operations outside India include power plants in Europe, Mexico and Australia, and Istanbul airport. In June, the firm had cancelled institutional placement of shares due to inadequate response. Since then, market demand for share sales has picked up and its board subsequently approved raising up to Rs1,000 crore through preference shares. “We have about Rs20 billion capital readily available... Another (Rs)10 billion, we have raised from LIC (Life Insurance Corp. of India)," Subbarao said. Subbarao said an initial public offering for its power generation unit, GMR Energy, was among the group’s various capital-raising options. GMR’s airport operations contribute about 45% of group revenue, and this may rise in the short term as passenger traffic increases, but the long-term drivers would be in meeting India’s power and infrastructure shortages. “The power sector looks very promising, we estimate that the shortage situation will continue... The road sector will now be able to catch up in the near future," Subbarao added. GMR will build about 6,700MW of power capacity, almost nine times its existing 800MW capacity, in the next five years, and plans to diversify into power transmission and distribution to transform into a fully integrated power player, he said. Given India’s focus on building highways, Subbarao said it would aggressively bid for big road projects. “We are already qualified to submit the price bids for about nine road projects, close to Rs100 billion," Subbarao said. GMR Infrastructure leads a consortium that is rebuilding the New Delhi airport, developing the international airport at Hyderabad, and also holds a 40% stake at the second airport at Istanbul in Turkey. The firm sees revenues from its airport business picking up as traffic levels improve, given the economic recovery globally. “In Delhi we have seen about 22% growth quarter on quarter, and in Hyderabad 8-9%. Queues are getting longer as business sentiment is improving," he said. Subbarao expects the Hyderabad project to make profits in the fiscal year starting next March, but the larger Delhi airport would take another three years to generate profit because of higher capital expenditure. GMR has sold 30 acres of its 250 acres of its land holding at Delhi airport. It plans to sell another 15 acres by January and another 25 in 2010-11. Shares of GMR Infrastructure, valued at $5.3 billion, rose 0.8% on Tuesday in a Mumbai market that fell 0.3%. The shares have risen 77% in 2009, in line with the rise in the main index.